Dutch producers Laidback Luke and Made In June join forces on Dim Mak for their single ‘Paradise’. Fusing warm synths with the airy vocals of Bright Lights, the tune shows Laidback Luke’s range as he steps out of his electro comfort zone on this crossover house song. Laidback Luke began producing in the mid-1990s and arguably played an important role in bridging the gap between pop and electronic music today. He has ranked on DJ Mag’s Top 100 DJ list for ten consecutive years and has become a mainstay at festivals all over the world including Ultra Miami, Tomorrowland, EDC Las Vegas, and more. Through collaborations such as ‘Show Me Love’ (w/ Steve Angello ft Robin S), ‘Leave The World Behind’ and ‘Get Dumb’ (w/ Swedish House Mafia’s Axwell, Ingrosso, and Angello), ‘Turbulence’ (w/ Steve Aoki ft Lil Jon), ‘Hey’ (w/ Diplo), recent releases like his Ralvero collaboration ’XOXO’, and official remixes for some of pop music’s biggest stars including Madonna, Daft Punk, and Depeche Mode, Laidback Luke is well-known within dance music. The writing and vocals on the track belong to multi-Grammy nominated DJ - singer/songwriter Bright Lights. Last year, acclaimed Dim Mak debut Runaway. with 3LAU landed her in the top 5 on Billboard’s Dance Charts and received support from Pete Tong, Hardwell, Borgeous and more. She is also the vocalist and songwriter behind tracks such as Porter Robinson’s ‘Language’, Hardwell’s ‘Never Say Goodbye’, 3LAU’s ‘How You Love Me’ and ‘Follow You Down’, off Zedd’s ‘Clarity’ album. 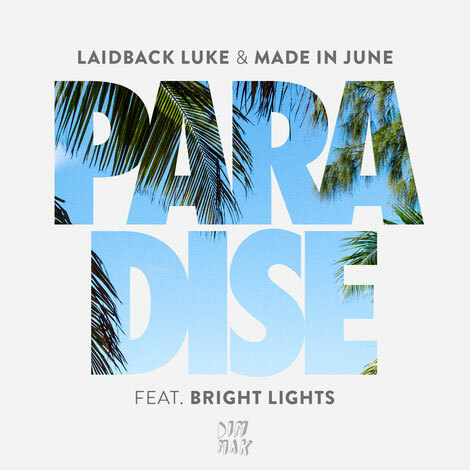 Teaming up with Laidback Luke and Bright Lights on ‘Paradise’ is the up-and-coming Made in June. After her single ‘You & I’ solidified her as the first Dutch female DJ with the “Dance Smash” of the Week on Holland’s biggest commercial radio station, Made In June’s profile skyrocketed. As a result, the house producer secured a spot at festivals Tomorrowland and Amsterdam Dance Event (ADE). In addition to DJing and producing, she has also directed music videos, commercials, and films. She worked as assistant director on Paul Verhoeven’s 2006 film Black Book, and has directed her own music videos including ‘Perfect Storm’ and ‘You & I’.